How did Richter Make his Paintings? In 2011, Tate Modern had a major retrospective of the work of German painter Gerhard Richter. Exhibition curator Mark Godfrey asked Tate paintings conservator about the artist's extraordinary technique. MARK: Rachel, I want to ask you some questions about three paintings in the central room of the Richter show - Room 10. This is the room with his 1990s abstract paintings, which I think are some of his most amazing works. Let’s start with the Wald paintings. What have you learned about Richter’s technique from studying it? RACHEL: Mark, you have told me that the Wald series of paintings started out as large colourful almost super-realist paintings of trapezoid shapes appearing to fly out towards the viewer. The film of Richter painting shows how he frequently paints quite detailed under-paintings which he might muse over and consider for some time. This is an extraordinary process bearing in mind that 90% of this image will be permanently hidden by subsequent paint coverage. So, after the under-painting is determined ready Richter then covers it with thick oil paint, sometimes using wide headed brushes but more frequently with his squeegee. The squeegee usually comprises a length of flexible Perspex fitted with a wooden handle. The edge of the Perspex is used to etch, scrap or smear the paint across the surface of the work. In the film showing Richter painting we also see the artist distributing oil paint along the length of the squeegee and then applying it to the surface. This creates a smooth buttery wet into wet surface on which to start ‘disturbing’ the paint. However, I don’t think he has done this with Wald 3. I think he has used a clean squeegee and used it to disturb the layers of existing oil paint. The clean squeegee has been dragged across the surface. This is usually in a direction horizontal to the picture plane (as in Wald 3). However, in other paintings you see the squeegee track suddenly veer off in a contra- compositional direction creating sharp paint statements (as seen in Abstract Painting 1999 (CR:858-6)). If we think about the very large scale of Wald 3, we must consider the logistics of one man making this painting. Although Richter probably dragged the squeegee across the wet surface in two separate applications this process must have demanded enormous physical energy. The two resulting squeegee tracks are obvious: one track extends from the top to about 5/8 of the way down the painting surface and the other starts just below this. It would appear that Richter applies the squeegee first to the left side of the work and then drags it from left to right: with both tracks he appears to stop ¾ of the way across for a rest before completion. You can also tell exactly when the momentum of dragging the squeegee across the very tacky surface began to slow down as the drag marks become more shallow. The upper track is characterised by the squeegee having embedded itself more deeply into the paint resulting in slightly sharper surface disturbances and deeper excavations. The lower track has glided more fluidly across the surface creating lighter disturbances. There is undoubtedly an element of chance in the results of this technique: the first track will bear most influence on the final composition whereas with the second track, Richter tries to replicate the same direction, speed and weight behind the squeegee to re-create the same marks in the paint. The compositional balance between track 1 and track 2 in Wald 3 exposes Richter’s trust in his materials and intuitive craftsmanship. MARK: You mention Abstract Painting 1999(CR:858-6), another of my favourite groups. It is one of a series made on a different support - not canvas. RACHEL: Abstract Painting 1999 (CR:858-6), unlike Wald 3 is painted onto Alu Dibond, a panel comprising a polyurethane core sandwiched between two layers of aluminium. This material has been widely used by artists as it provides a light, flat and rigid support that has little aesthetic or visual impact on a painting. 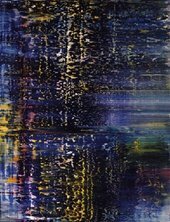 Richter has applied his paint in a similar manner as before, manipulating the paint with a squeegee when the paint is very newly applied, hence its fluid character. Richter does not maintain a horizontal direction as he glides his squeegee across the surface, rather he plays with it. The squeegee is moved up and down in rapid movements to create the rippled effect seen on the left side. Once the paint has dried Richter has taken a sharp wide-head palette knife and gouged and scraped features out of the paint layer, exposing the paint-stained white preparatory layer beneath. The technique creates a hallucinatory effect (are the shapes portals or are they solid elements floating in a multi-dimensional composition?). MARK: Richter often seems to scrape the surface of an abstract painting with a knife, or the wrong-end of the brush, but occasionally he also takes a knife and cuts into the top layer of paint, and then peels off some of the top skin of the painting. We see this clearly in Abstract Painting 1997 (CR 849-2) where there are several peeled-away sections. It is a work that reminds me of Jackson Pollock’s Out of the Web (1949) where he also exposed jagged sections of the masonite support. What’s going on in this painting? RACHEL: That is an interesting comparison. I can see how you are reminded of the Pollock painting but to me they are so different. In Out of the Web there is a more gentle relationship between the peeled off elements and the dripped and splashed surrounding paint. The overall effect is compositional harmony. In Abstract Painting 1997 (CR:849-2) the shapes are contra-compositional, they stand out and demand attention. The main body of composition, as with the other Richter works, is made using the squeegee technique. Again the effect of peeling off or gouging out shapes in this fluid multilayer flat bed of paint creates a multi-dimensional composition. The surface appears to move at rapid speed right to left, perhaps in the direction of the squeegee application. The effect of these rough-edged and deeply gouged shapes, comprising the exposed dark blue and red paint of under-layers, make them static independent elements against the backdrop of a storm of rapidly moving red paint. To me, Richter has achieved in paint an effect similar to what sophisticated special effects achieve in film. The effect created by Pollock is, to me, more lyrical. Abstract Painting 1997 is again a larger scale work and the gouged, scraped or peeled off marks are also in larger scale. As with Wald 3 versus the smaller abstract works, Abstract Painting shows how Richter’s technique is not made any less effective by increased scale. His techniques are tried, tested and versatile. MARK: How come he was able to peel away the top layer of purple/red paint without disturbing the underlayer of blue paint? I would have thought the different layers stick to each other, but clearly this isn’t the case…. As I said previously I think Richter leaves his paint to dry in between different layer applications. Sometimes that is because he wants to muse over his composition, refresh himself or his idea and perhaps re-work it or possibly because he knows its necessary to do so in order to create his desired surface effects. We have already established that he knows paint and how to manipulate it. I think he paints a relatively thin underlayer which will dry relatively quickly, probably leaves it for a week or two, applies another thicker layer, leaves it for a few days until touch-dry but still relatively plastic and then cuts out a shape with a knife. He then carefully peels off the plastic-like thicker cut-out oil paint shape. Because the under-layer has been left to dry he knows he will be able to achieve a clean separation between the upper and lower layers.